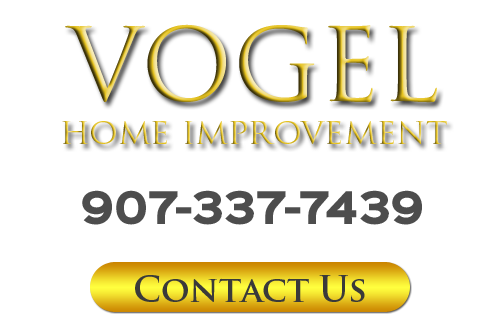 One of the greatest pleasures in remodeling is referral business and the best way to find a good contractor is always word-of-mouth. 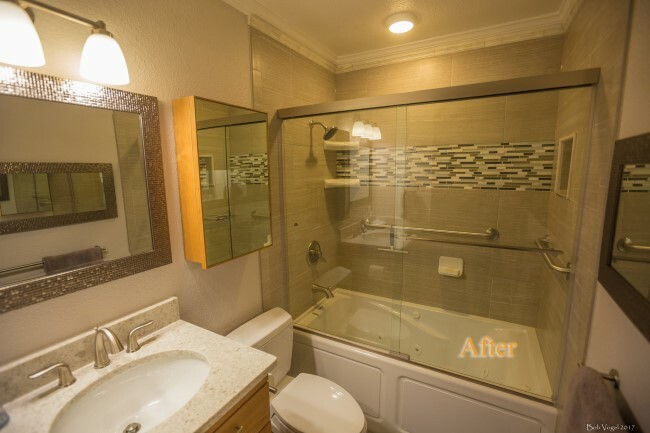 This project included renovating both up and downstairs bathrooms for clients who are neighbors with a client from a previous master bath renovation. After renovating both of their bathrooms I went on to replace all the interior doors in the lower level of this great 1970s split level-entry which was another challenge unto itself, working around fish tanks, dogs, cats, and their young girls' owners. It was a pleasure working with such a hospitable family who came up with great design ideas I was happy to bring to life for them. 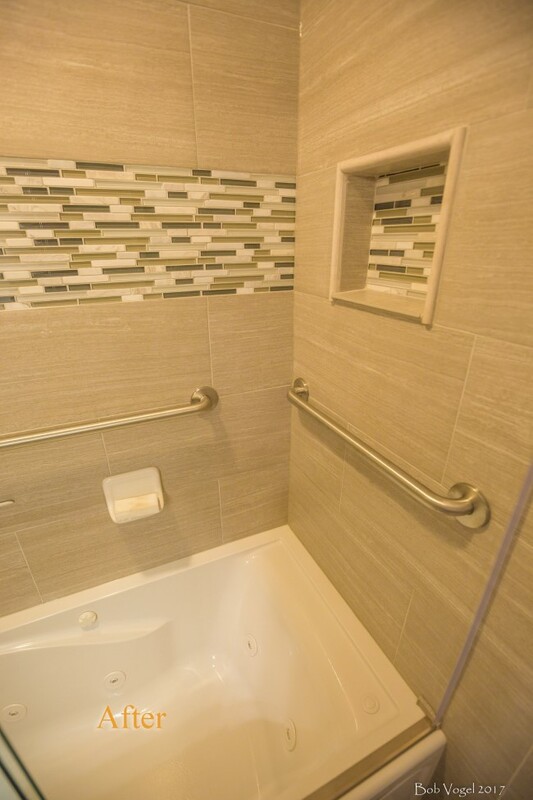 These are a few photos of the basement bath phase. 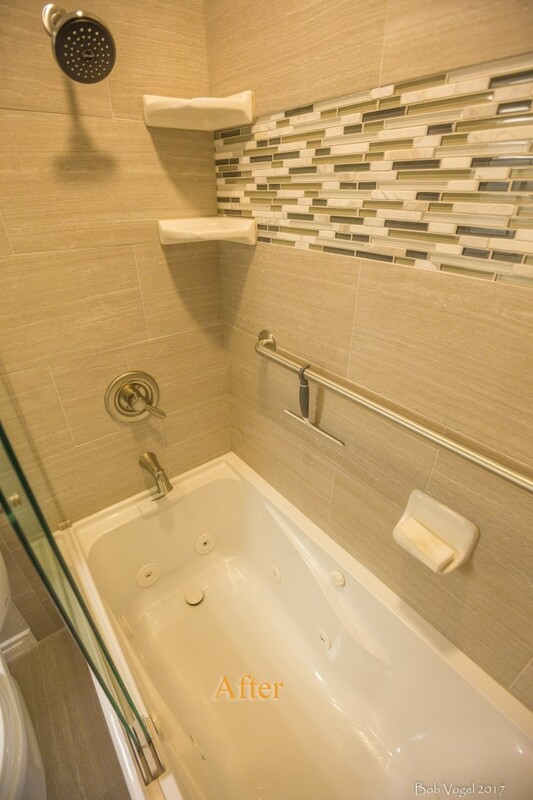 It included replacing the original conventional bathtub with a jetted tub. Always challenges there with a properly placed mortar bed and finding and routing an electrical circuit, not to mention dealing with 45 yr old cast iron drain plumbing while excavating a well-cured concrete slab. Amazing how much accumulated hair buildup there is in a drain like that! No surprises too big though, and everything came together just fine thanks to years of experience doing bathroom remodeling. 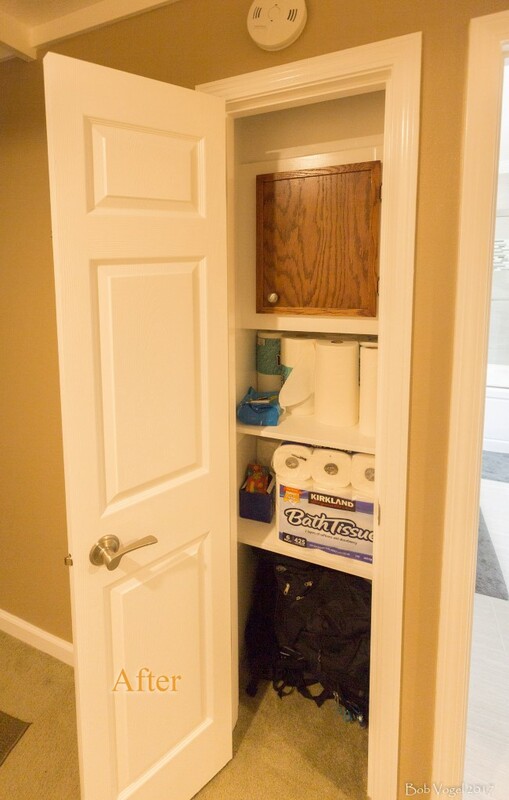 One photo is of their hallway linen closet. After initially seeing what was in there, I rebuilt the shelves and upper laundry chute section along with replacing the linen closet door, creating a much more efficient and eye-pleasing storage. I also included a tiny self-closing laundry chute access door, stained and varnished for an added touch, no extra charge, just because this is what I like doing for good people. 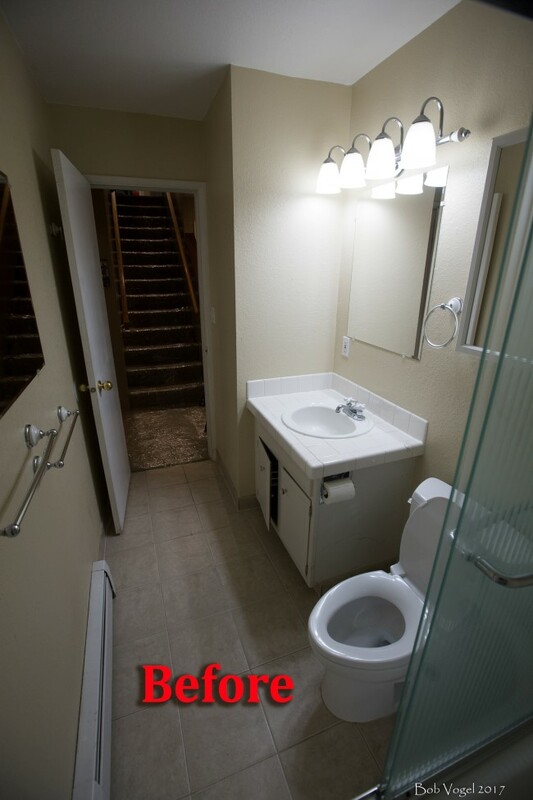 "We LOVE our new bathrooms! We just wrapped up two bathroom remodels as well as installation of new doors downstairs. 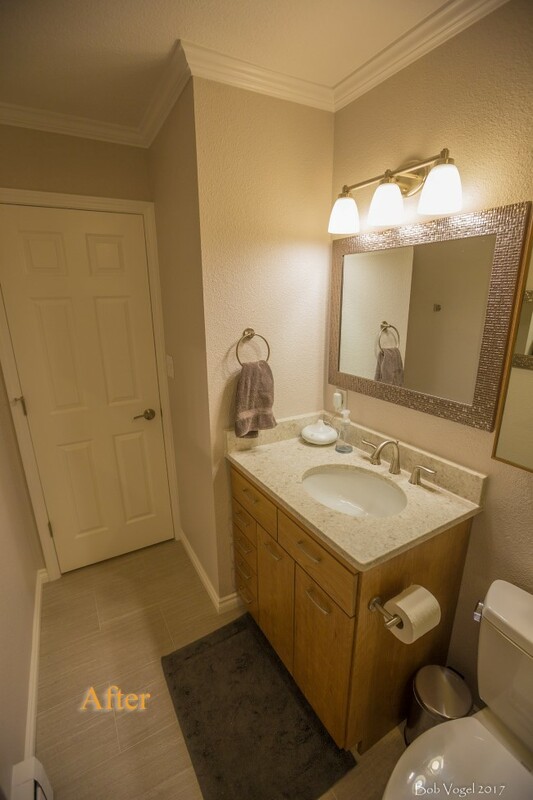 Our bathrooms were total makeovers, with removal of all prior fixtures, repainting, tile work, as well as installation of new cabinets and fixtures, a shower upstairs and a jacuzzi downstairs. Bob is extremely professional and reliable and most importantly, a true craftsman who worked closely with us on the design. He paid close attention to details throughout the project, including in his preparation and organization of the project, the work process itself, and in maintaining the work space and cleaning up. His bids were spot on and his billing was timely and complete with all receipts. We are completely happy with his work and recommend him highly." ~Elaine J. 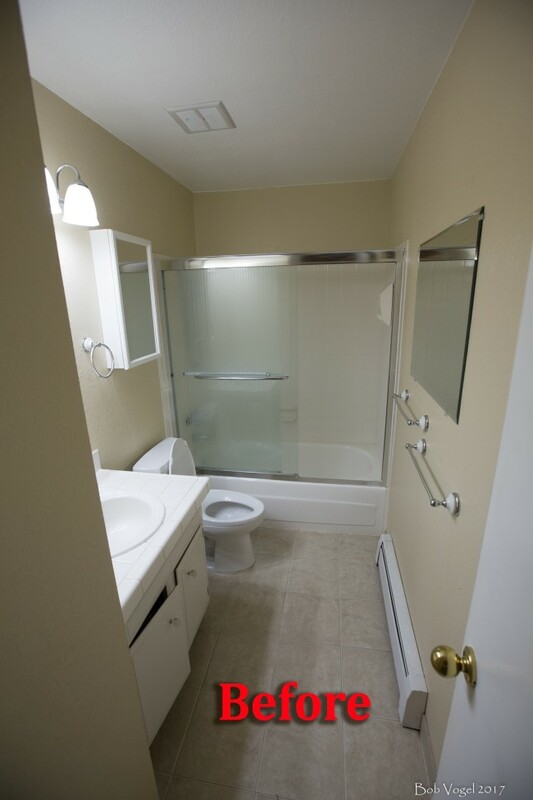 If you need a professional remodeling contractor for your Anchorage bathroom or basement renovation project, please call 907-337-7439 or complete my online request form.